Defying cynics, racists, and street gangs, Justine Presha’ DeVan became one of the most in-demand muralists in Chicago and the country. She shared the remarkable story behind one of her most enduring works. As someone who is often considered one of the mothers of the contemporary mural movement, Justine DeVan has certainly painted her fair share of murals. She has led, contributed to, or advised mural projects across the country since the late 1960s, beginning in her native Philadelphia. 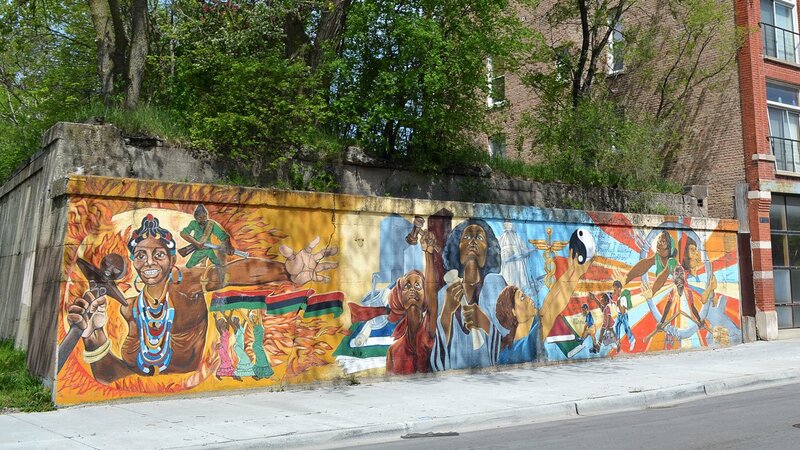 But one mural holds a special place in DeVan’s heart: Black Women Emerging, located on a residential stretch of South Cottage Grove Avenue between East 41st Street and Bowen Avenue. 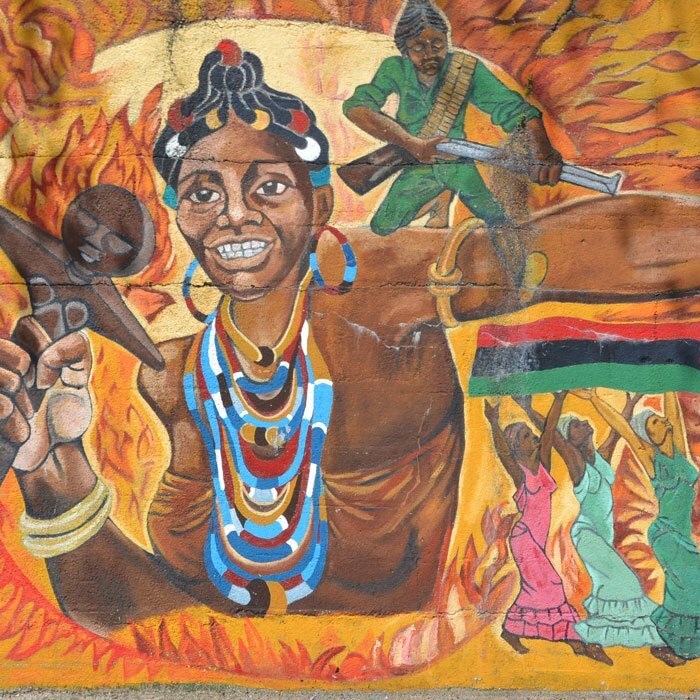 Completed in 1977, the mural forms a thematic triptych, according to the artist: the first section represents Mother Africa and the contributions of female revolutionaries during the postwar decolonization of Africa; the second spotlights black women’s educational and professional achievement; and the third depicts black feminist liberation. 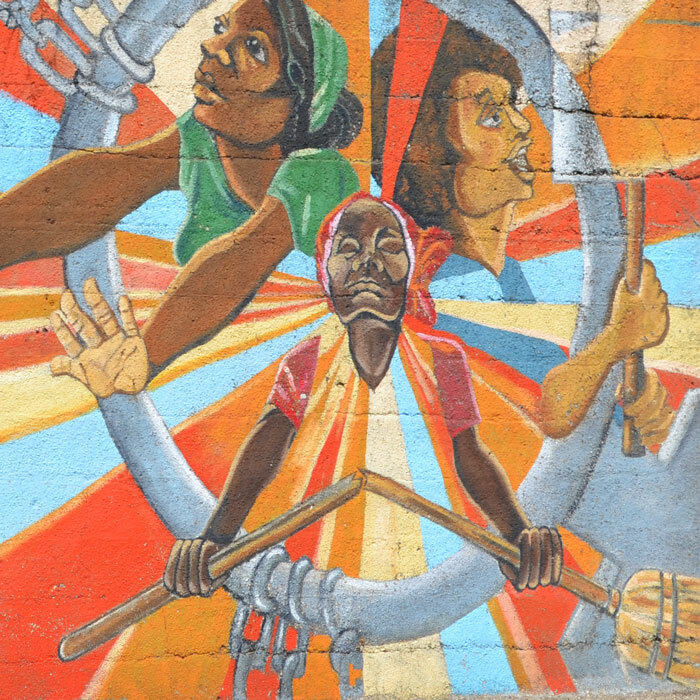 At the time DeVan painted Black Women Emerging, Chicago was an established nexus for the contemporary mural movement, catalyzed by the creation of the Wall of Respect ten years earlier at 43rd Street and Langley Avenue. 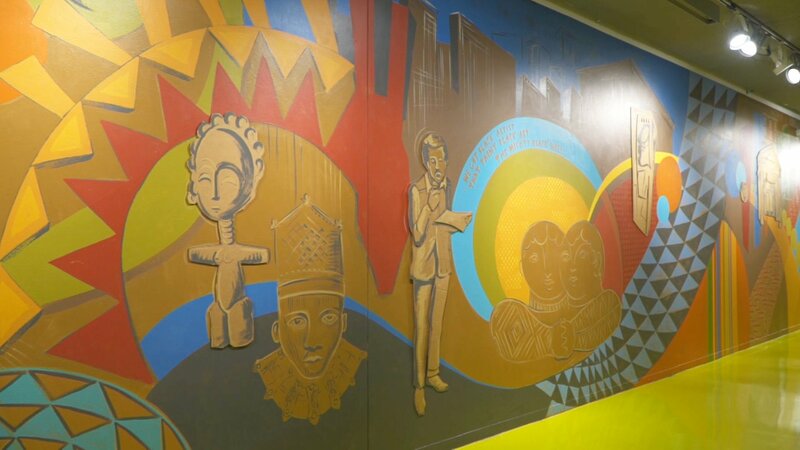 Depicting African American artists and activists, the Wall of Respect was the collaborative product of numerous black artists, including eminent Chicago muralist Bill Walker (1917–2011). In 1973, DeVan enrolled at the School of the Art Institute of Chicago and also joined the Chicago Mural Group (now the Chicago Public Art Group), a nonprofit collective cofounded by Walker. 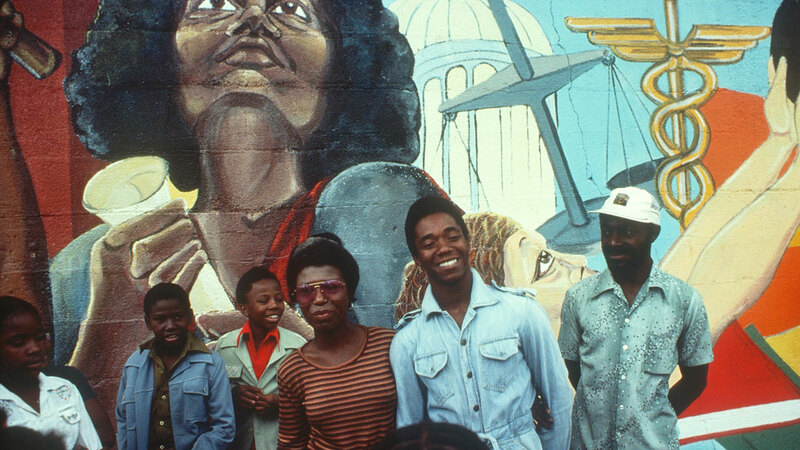 She always considered herself “an educator first, artist second,” turning away a lucrative career as a commissioned artist in favor of creating social justice–oriented art with the Chicago Mural Group. It was through the Chicago Mural Group that DeVan met Walker, the most influential mentor in her life. She recalls meeting him for the first time, appropriately, at a project site: his famous History of the Packinghouse Worker, at 49th Street and Wabash Avenue. Walker was painting on a scaffold several stories tall. That grit would serve DeVan well in her work for the Chicago Mural Group. The collective sent its artists to work in neighborhoods across the city, with a special emphasis on underserved communities. DeVan’s cohort included Japanese, Thai, and Indian artists, but she quickly learned that Chicago, with its rigidly demarcated ethnic neighborhoods, didn’t reflect the same level of integration. She learned Polish just so she could communicate with Polish residents, many of whom didn’t speak English. Moreover, as a college-educated black woman from the East Coast, she was seen as an outsider in some neighborhoods. In the most insular communities, her presence sometimes provoked distrust – or worse. She recalled hostile run-ins with white Marquette Park residents while working on the collaborative mural Prescription for Good Healthcare. “They reminded me that they had run out Dr. Martin Luther King,” she said. One night, DeVan was working late on her section of the mural when a group of men screamed the N-word at her. She ignored them. Then, the unimaginable happened: the men vowed to protect DeVan. “They told me, ‘If anyone bothers you, tell them we’re coming by!’ They drove by every other day,” she recounted. Black Women Emerging was another example of a project nearly gone awry. It was to be DeVan’s first solo mural project, and Walker suggested she paint the mural on a retaining wall covered with graffiti approximately two blocks from A Time to Unite, a mural she’d completed with Calvin Jones and Mitchell Caton the year before. Unbeknownst to DeVan, the wall in question was actually a memorial wall listing the names of deceased members of the Blackstone Rangers, the influential South Side gang. Families living in the nearby Ida B. Wells and Washington Park public housing projects extended extraordinary kindness to DeVan, bringing her food and water and opening up their homes. Even so, DeVan’s work started mysteriously disappearing. One day, she returned to her mural to find it completely painted over, forcing her to start over from scratch. Then it happened again. And again. “The wall was painted out five times,” DeVan said. At the end of her first week, a few Rangers approached DeVan while she was working. They demanded she stop the project. Shortly, a young, handsome man approached DeVan from across the street. He explained to her the significance of the wall; DeVan, in turn, explained who she was and why she was working on the project. Remarkably, after that meeting, the Rangers didn’t just leave DeVan alone, they protected her, just as the slur-yelling Marquette Park residents had. In return, DeVan likes to think that she and Black Women Emerging taught the Rangers something about self-sufficient womanhood. After spending several summers in Chicago, DeVan relocated to Philadelphia permanently in 1980. She has continued to visit Chicago frequently, often to advise public art projects. Many years later, DeVan returned to 41st Street and Cottage Grove to visit the neighborhood. “As soon as I stepped in there, my first time, there were some people still living in the public housing that came out and said, ‘We remember you!’” she recalls. Neighbors said they’d kept an eye on the wall. 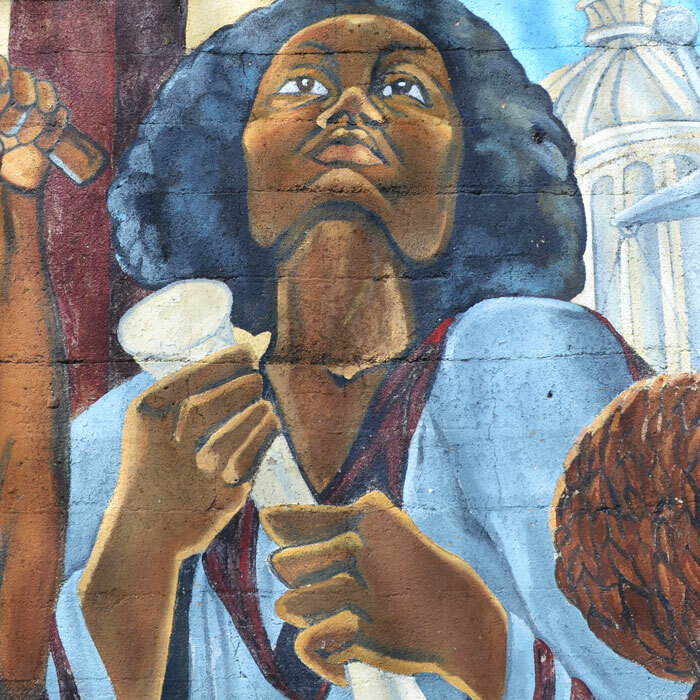 To this day, thanks to the upkeep of the community (and DeVan’s five-coat priming job), Black Women Emerging remains one of the most intact Chicago Mural Group projects from that period. “That wall never, ever had graffiti on it, unlike some of our other murals,” DeVan claims. When asked if she’s visited her murals recently, DeVan says no – not out of indifference but because there’s hardly anything to see anymore. Most of her murals, along with other Chicago Mural Group projects from the same period, are long gone. Even the seminal Wall of Respect, which inspired DeVan to move to Chicago in the first place, was destroyed in 1971 after a fire tore through the TV shop on which it was painted. The housing projects are also gone, razed in the late ’90s and early 2000s. But Black Women Emerging – newly vibrant, thanks to a 2001 restoration – still remains, timely as ever.